one of my favourite things to do (or quite possibly My Favourite Thing to Do) is hang out in a bookstore for COUNTLESS hours. this Hong Kong bookstore, nestled on the 3rd floor of an old building in the middle of crazy/chaotic Causeway Bay, is cosy, unpretentious, warm, sincere and heartbreakingly sweet. i wish i knew how to describe how much i love Mackie Study! Singapore's very own awesome little bookstore, BooksActually specializes in fiction titles and other literature-related goods, like their Birds & Co line of quaint, hand-sewn notebooks and pencils. they've recently moved to Ann Siang Road -- their new space is amazing! other than fiction, they've also added new titles in "Critical Theory, Non-Fiction, Art, Film, Poetry, Antique, Travel Narrative and Food Narrative sections", so you've no reason to step into a chain mega-bookstore again (but i still love Kino ;p)! 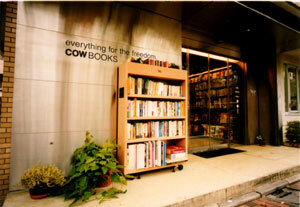 Cow Books is a bookstore in Tokyo that sells "out-of-print books focusing 1960-70s social movements, progressive politics, Protest, the Beat Generation, and first editions of forgotten modern authors"
a must-visit for anyone who's going to Tokyo. 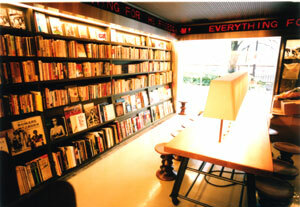 i mean, how many bookstores focus on selling books by Jack Kerouac, Allen Ginsberg and friends?? i've only been to the mackie study at the art centre. didn't know there was a full blown shop! they also recently opened a mackie kitchen a few streets away from mackie study!